"We do not take a trip, a trip takes us." This two-day trip took us to some beautiful places we haven't seen before. 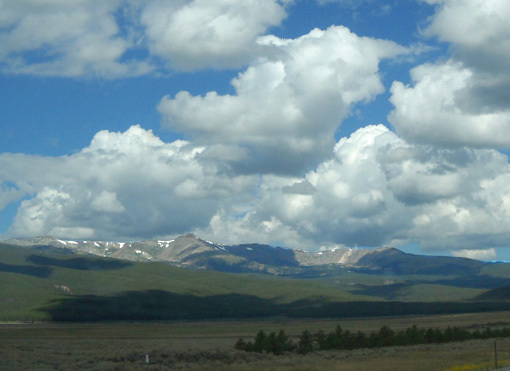 We've traveled several previous times from Leadville to the Reunion Flat Campground in Teton Canyon on the western side of the Grand Teton mountain range but this is the first time we've taken the route I'll be describing in this and the next entry. 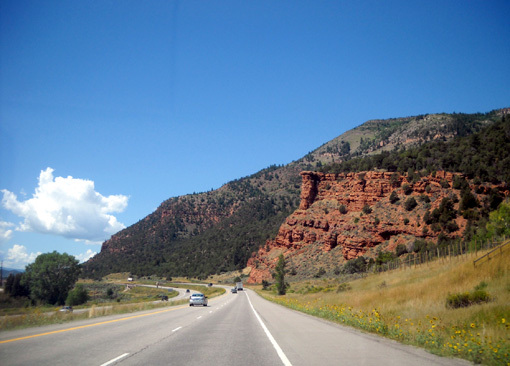 A couple other times we got to Teton Canyon via a more westerly route through Salt Lake City and Logan, UT so Jim could train on The Bear 100 course in the northeastern corner of the state. Those years we went up to the Grand Teton Race (GTR), which is held at a ski resort above Teton Canyon, before and during Labor Day weekend. Jim used the GTR 50-miler as training for The Bear, which is held later in September. Now that Jim's bum knee prevents him from running he didn't enter those two races this fall. But we love the Teton area so much that we decided to keep our reservation at Reunion Flat. Late summer/early fall is a beautiful time of year to visit either side of the Tetons -- and they are cooler than many other places right now. 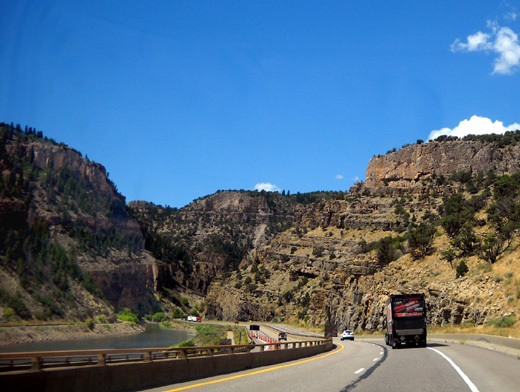 We modified our Reunion Flat CG reservation with the National Forest Service more than once because we thought we might like to camp near Dinosaur National Monument and/or in the Flaming Gorge National Recreation Area for a few days on the way to Teton Canyon. We changed our minds about that, however, mostly because the temperatures are hotter this week than we like for boon-docking. We can run one AC unit with solar power and the generator but it's a strain on the system. We need to do more on-site research of the Forest Service campgrounds in the Flaming Gorge area before spending several days there. Some of the sites are in forests at higher altitudes where it is cooler; many of them aren't big enough for a 36-foot 5th-wheel, though. At the last minute we decided to just head for Teton Canyon and not stay overnight at the Gorge or the national monument. Along the way we'll eyeball some of the camping opportunities for a future visit. 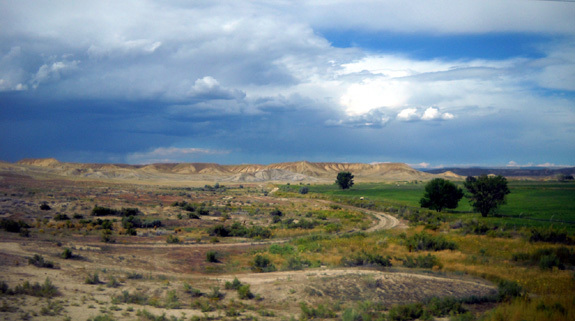 On this route we will get to see some territory that is new to us between Rifle, CO and Green River, WY. We've been on the other parts of the route at least once before and we know they are scenic. This is a shorter but possibly slower route than we took last year when we went through SLC to the same destination because we'll have more two-lane roads. Although I'll point out some specifics for RVers in these entries, most of the information about routing, road conditions, and scenery is applicable to other vehicular travel, too. Our goal today was to reach Vernal, UT. We weren't in any hurry to leave Jack's place in Leadville this morning because the predicted temperature in Vernal was 90 F. today. Since we planned to stay overnight in the Walmart parking lot we didn't want to arrive until it started to cool down in the evening. 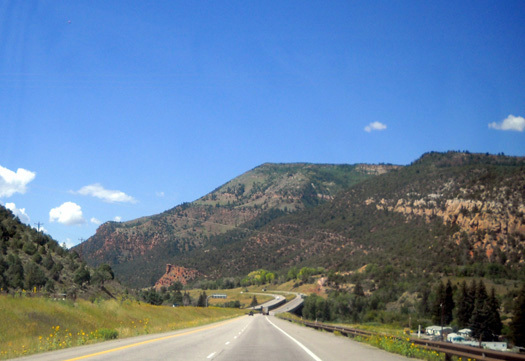 The hillsides along I-70 between Minturn and Rifle come in a variety of colors. Jim had plenty of time to get breakfast at the Subway in Leadville after he got up. He�s been there so many times in the last three weeks that the young fella who works there has started asking him if he wants �the usual.� Ditto with the gal at Kringos, a little restaurant where Jim stopped on the way out of town to get a sandwich to eat later for lunch. We headed out the north side of town a little before 11 AM. Despite our late departure time and several stops during the afternoon we got to Vernal about 5 PM -- and it was still in the mid-80s F.
We shoulda killed even more time! The weather was good all day, sunny with lots of billowy clouds. We thought we might be driving into a thunderstorm in Vernal but we didn't get into any rain. 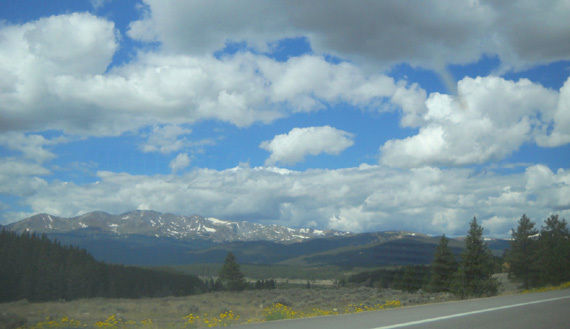 Temperatures were in the 80s and 90s F. in the afternoon even though we were still about a mile high in elevation most of the way after we descended from Leadville (elevation 10,200 feet) to I-70. US 40 west to the Walmart in Vernal, UT. 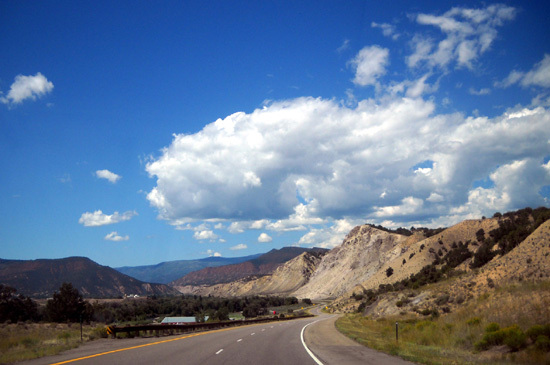 US 24 between Leadville and I-70 had several construction zones. The only one where we had to wait a couple minutes was about five miles north of Leadville. Otherwise, US 24 was fine. 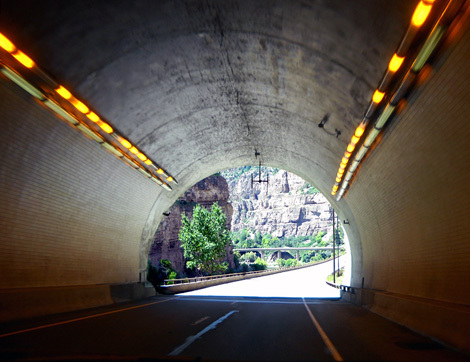 It�s hilly and curvy but very scenic through the mountains. Leadville and Minturn are the only small towns with narrow streets where we had to drive slowly. It took about an hour for us to get to the freeway. 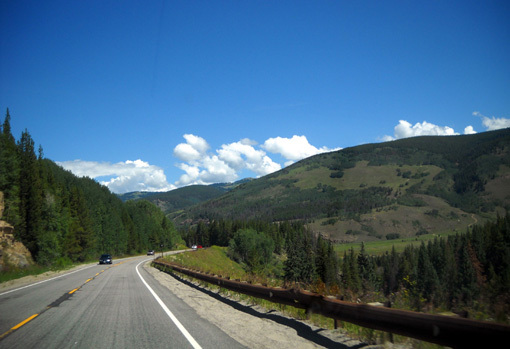 I-70 from Minturn (exit 171) to Rifle, CO (exit 90) is very colorful and scenic. We just did this stretch a couple months ago when we went from Colorado Springs to Silverton and I showed some other photos then. There are lots of sunflowers in bloom along the freeway (and all the way to Vernal, UT). The rivers are lower now; they were pretty high in June from all the snowmelt. 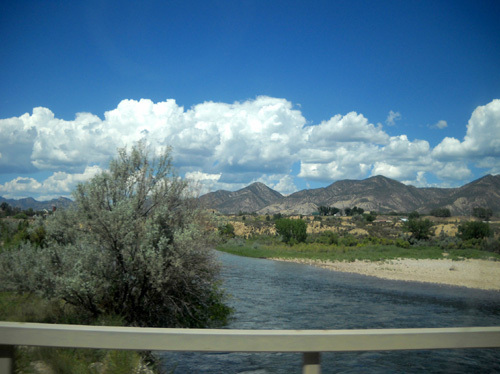 We followed the Eagle and Colorado Rivers on I-70 and the White River for quite a while along CO 64, farther to the north and west. This was the beginning of the stretch that is new to us. I drove from Rifle to Rangely so Jim could get on the computer and take a break. We stopped at the rest area at exit 90 in Rifle for a few minutes, then headed north on two-lane CO 13. We followed the longer truck route around Rifle inadvertently; it would�ve been shorter -- and OK with an RV -- to go through town. I remember we did that last year when we were hunting for diesel, but we continued west on I-70 then. 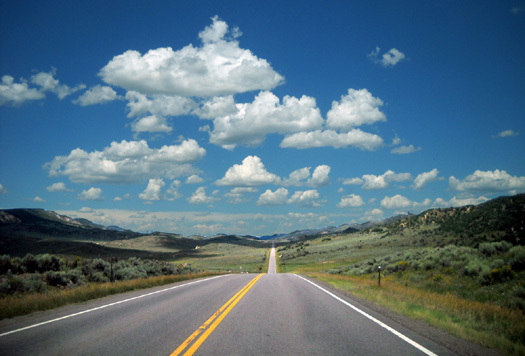 CO 13 is a �red� road on the AAA map. It�s wide, smooth, and scenic. 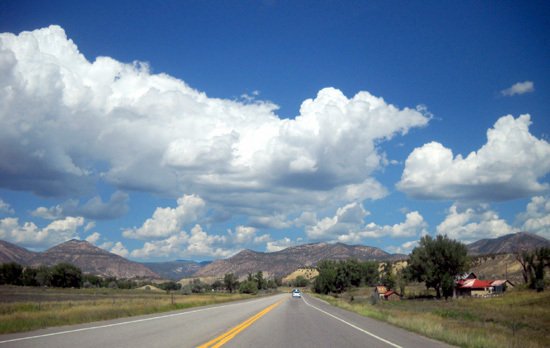 Although it�s hilly and has a lot of curves I was able to go 55-60 MPH with the camper most of the time (we don't go much over 60 on freeways, if that tells you anything about CO 13). I saw about a dozen RVs going southbound in 38 miles on this road. CO 64 is a �black� road on the AAA map. It is more narrow and not as well maintained as busier roads but OK in an RV. There was less traffic than on CO 13. I went slower (mostly 50-55) because of the curves and bumps. The speed limit was 65 MPH on a lot of it. This road follows the White River Valley for about 66 miles so it was very green and more agricultural than the other roads we were on today. 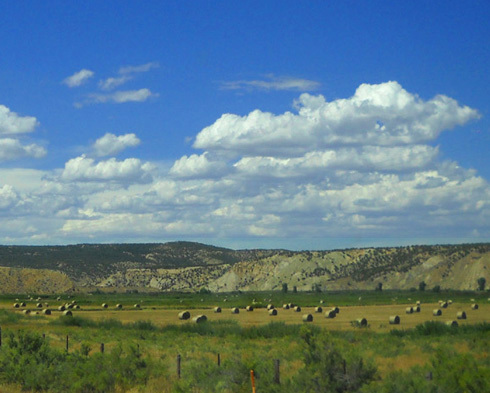 I took the hay bale shot farther above on this stretch of highway. We stopped again in Rangely to switch drivers, get something to eat, let Cody eat supper, etc. Jim drove the rest of the way to Vernal. 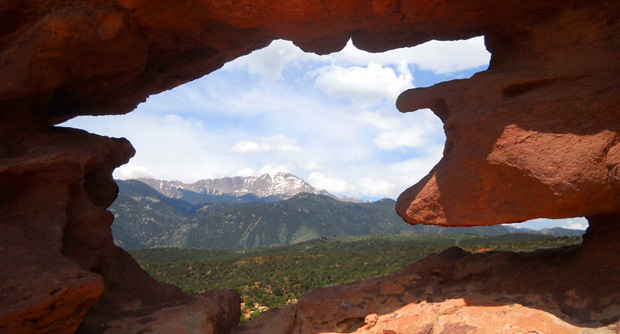 The scenery wasn�t as nice here � oil rigs, gas pipes, brown rangeland, brown mesas. We could see a storm to the northwest but we didn�t get into it. 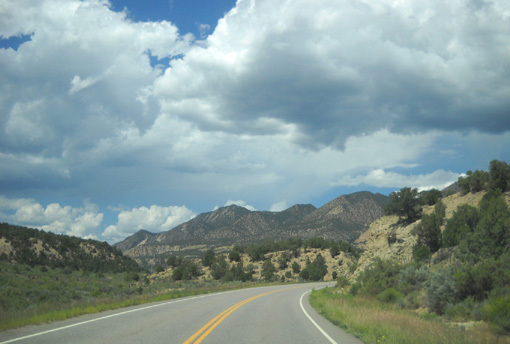 In Dinosaur I wanted to go east on US 40 just a bit to see the Dinosaur National Monument visitor center. We thought it was closer to the junction of CO 64 and US 40 but it's two miles east. When we didn�t see it after a mile, we turned around and I went into the welcome center at that intersection instead. 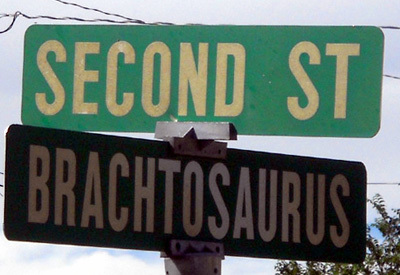 Most of the streets in this town are named for dinosaurs. I was able to get the National Park Service brochure for the national monument at the visitor center. 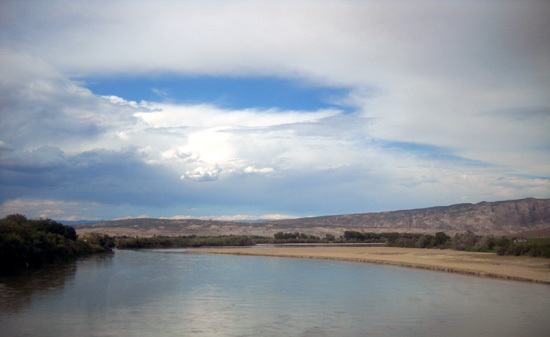 A loquacious gentleman named Melvin told me lots of things about the national monument, campgrounds in the area, a �great� natural resources museum in Vernal, and other useful information. 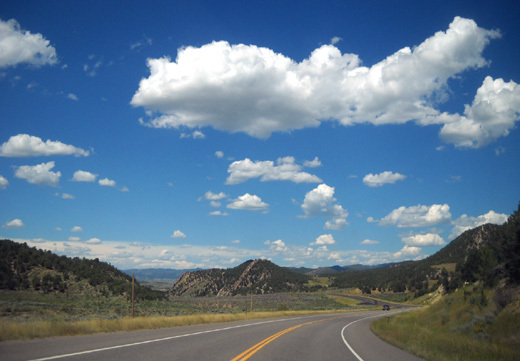 US 40 is much smoother and wider and had more traffic than either CO 13 or 64. Fortunately we didn't get any rain on US 40. That might have cooled things off, though. Among other tidbits of information, the man at the visitor center in Dinosaur told me that seven people work for the city of Vernal in the summer to keep all the petunias alive . . .
Minturn, CO had loads of pretty baskets-full of flowers on stands through town, too, but not as many as Vernal. 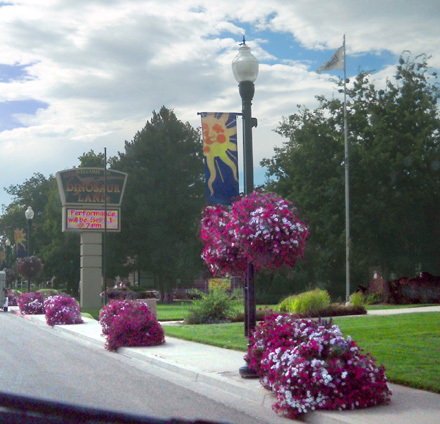 The guy at the visitor center in Dinosaur promised me I�d be impressed with all the petunias for which Vernal is apparently renowned. I love flowers . . . but if seven people are really on the city payroll to maintain petunias in the summer, I'm glad I'm not a taxpayer living in that town! 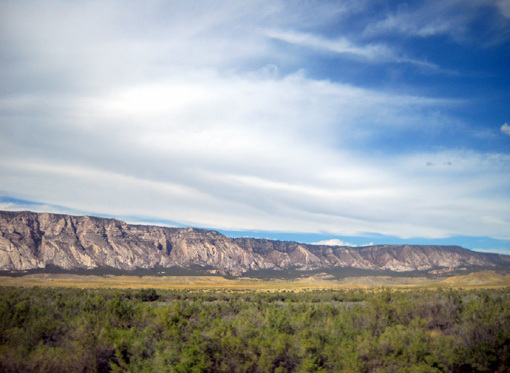 Vernal, UT is an attractive high desert town bordered by the Uinta Mountains on the north. 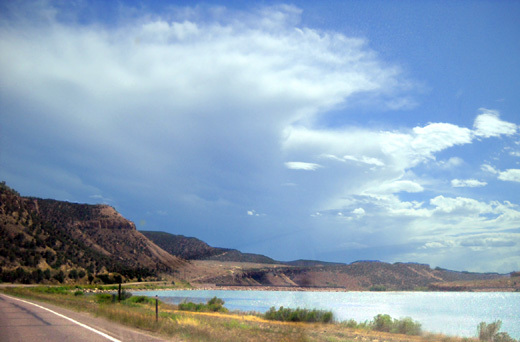 Many dinosaur fossils have been found nearby and it's close to Flaming Gorge National Recreation Area and Dinosaur National Monument. It looks like a nice place to visit. Although the town has a population of fewer than 10,000 people the business area is very long because it morphs into the town of Naples to the east. We had to drive several miles at low speed through both towns to reach Walmart on the west side of Vernal but the store was easy to find on US 40. We parked at the pharmacy end of the store temporarily, then went inside to shop. We loaded up on supplies because we won�t be near another Walmart for a while. Jim asked where they preferred we park -- at the other end of the store, near the back, was the answer. This is a good spot for Cody because of the grass. We aren't in a busy truck or entrance/exit lane so it's quiet, too. There were a couple of other RVs in the lot when we arrived and a few more came in later. 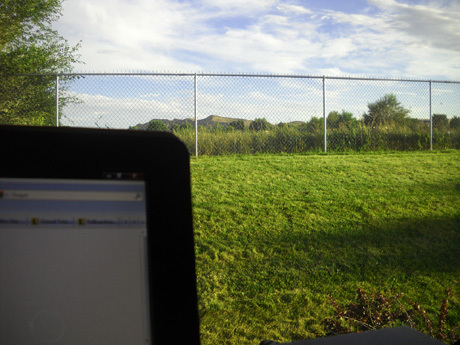 We were able to get the camper cooled down from 86 F. (same as the temperature outside when we arrived) to 75 F. by 8 PM. That's comfortable for sleeping. This is a large Super-Walmart; it had most everything we wanted. I went back later in the evening to get more stuff I thought of. Jim's happy. Not only do we have good TV reception, he also found our favorite radio talk-show host, Neal Boortz, when he unhitched the truck and went down the road to top off the fuel tank (this Walmart doesn�t have gas or diesel). Prices in town range from $3.91 to $3.95/gallon for diesel. Diesel was $3.84-3.87/gallon in Leadville this morning. Jim filled the truck tank yesterday because we knew prices along the way would be higher all the way to Teton Canyon. Our fuel mileage ranged from 13-14+ MPG today (net downhill to freeway, then up and down but no high passes after US 24).